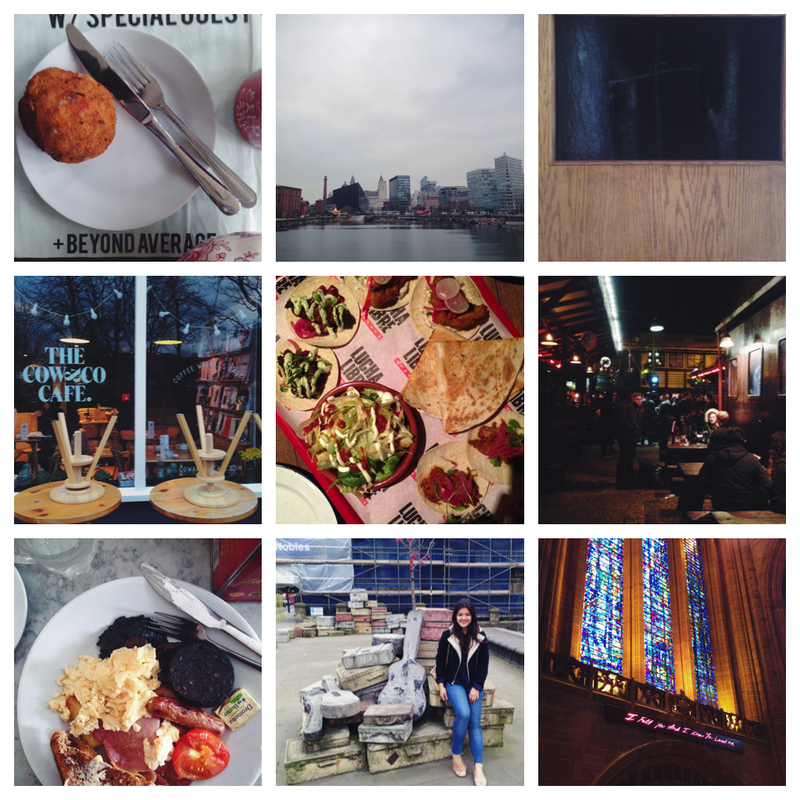 Last weekend I caught the train up to Liverpool (2 hours from London, people!) to visit my friend Sophie. It's the second time I've been up to see her and I have to say, Liverpool is fast becoming one of my favourite UK cities. I caught the train on Saturday morning and arrived in time for lunch. Sophie and I met at uni when we were placed in the same apartment in halls and it's safe to say we did a lot of culinary exploration in our first year. Sophie made us scotch eggs for lunch and my mind was completely blown! We caught up over lunch, then watched a few addictive episodes of Unbreakable Kimmy Schmidt (the theme tune is so catchy) before dragging ourselves up off the sofa to do a little exploring. One of the things I love about Liverpool is how much art and culture there is! Before I visited the first time, all I knew about it was the Beatles and the Scouse brow, but there are always exhibitions on and there's loads of street art. Those stone suitcases we passed on Hope Street (in the bottom row of pictures) were carved with names of all the famous Liverpudlians through history - and there's a lot! Stroll down to the Albert Dock, the home of Tate Liverpool, plus a bunch of bars, restaurants and an amazing view where the Mersey meets the sea. Stop in at The Bluecoat gallery. The current exhibition on Listening features film, installation and photographs. Order cinnamon courgette cake at The Cow & Co Cafe and buy the cute fair-trade crockery that everything is served on. Sample tequila cocktails downstairs at Lucha Libre before heading up to the restaurant for an awesome street food platter. Wrap up warm and try the craft beers at The Kazimier Garden for a more low-key experience of Liverpool's famous nightlife. Get up on Sunday morning for a belly-busting brunch at The Quarter. Admire Liverpool Cathedral, the UK's largest cathedral. Built in the 1970s, yet honouring traditional architecture, there's even a Tracey Emin inside! I loved it! I was expecting it to be all Desperate Scousewives but there's such an arty vibe and the city is mostly pedestrianised and quite small so it's easy to get around.